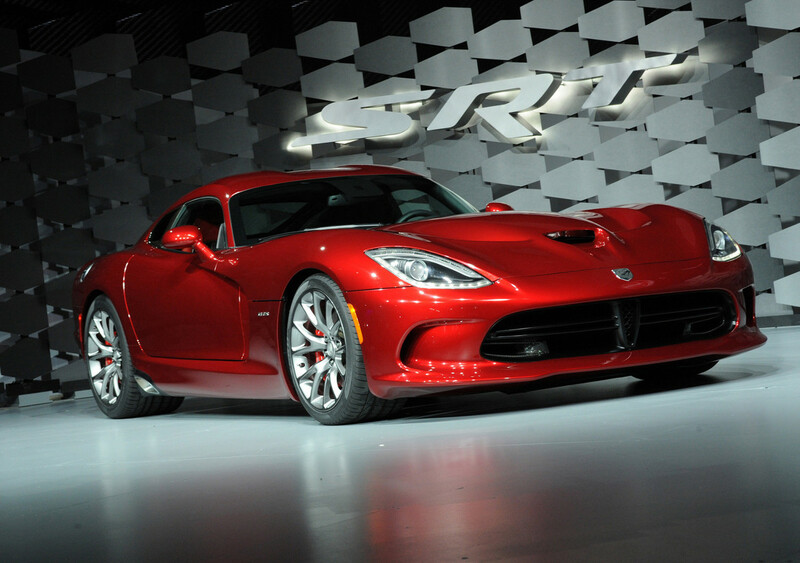 April 4, 2012, Auburn Hills, Mich. - The all-new 2013 SRT Viper was unveiled to the world today at the New York International Auto Show, marking its highly anticipated return to the high-performance sports car market. The fifth generation of the iconic two-seat, American-built supercar has been deliberately evolved to incorporate superior craftsmanship, a host of new technologies and ergonomic improvements while respecting its visceral legacy of outright performance. "After a gut-wrenching period of uncertainty, the Street and Racing Technology brand team is extremely proud that our hand-built in Detroit, flagship supercar is back and ready to take on the performance car world," said Ralph Gilles, President and CEO -- Street and Racing Technology Brand and Motorsports, Chrysler Group LLC. 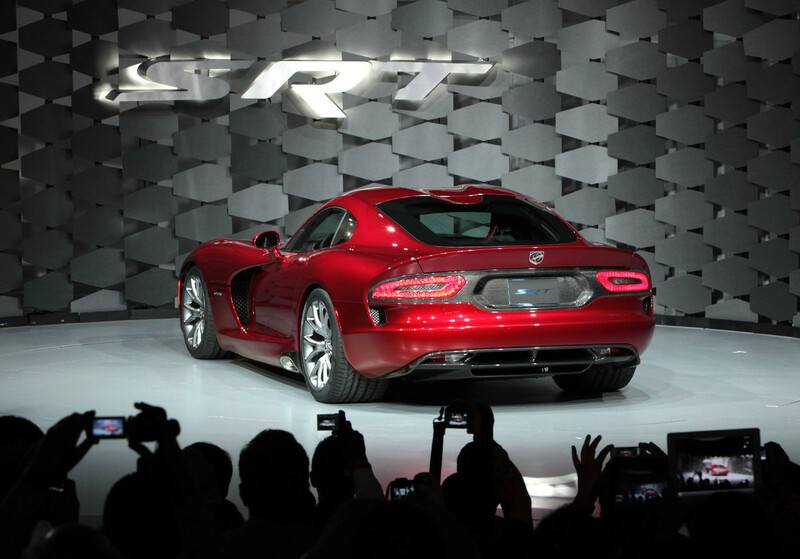 "Beyond being the flagship for the new SRT brand, the launch of the 2013 Viper proves that we simply would not let the performance icon of the Chrysler Group die. Willed to live on by a very special group of performance enthusiasts inside the company and across Viper Nation, this SRT team under our new leadership was challenged to not just continue the legendary Viper, but to create a world-class supercar that would showcase the very best we have to offer." For the 2013 model year, two new models of the iconic supercar will be hand built at the Conner Avenue Assembly Plant in Detroit -- the home for Viper since 1995. Both SRT Viper and SRT Viper GTS models offer new interior and exterior designs incorporating premium materials and new exterior surfaces with aerodynamically functional details that are beautifully integrated into the high-tech carbon fiber and aluminum skin. On the inside, designers and engineers strived to rethink all touch points; and upgrade all material appointments and technologies. "The SRT Viper model is meant to offer a perfect blend of extreme performance and a deliberate preservation of what has become the iconic DNA of the Viper," Gilles added. "We strove to deliver a supercar that continues to bring the driver as close as possible to the machine." The SRT Viper GTS builds on the DNA of the SRT Viper model with more technologically advanced solutions, like two-mode active suspension, to allow this world-class GTS to find new limits on the track while also opening up its envelope as a more premium and mature evolution of the classic, extreme performance formula. Designed and built with premium features and materials inside and out, the Viper GTS will compete with the best performance vehicles in the world with a wide range of creature comforts, advanced drivetrain and interior technologies. "We've purposely evolved the iconic soul and raw performance formula that Viper has maintained over the years," Gilles said. "Our returning customers will see the world-class levels of pride, quality and hand craftsmanship built into the 2013 Viper. With two price classes of the SRT Viper and SRT Viper GTS, we have offerings for both the traditional core Viper customer and for the new customer who wants the same performance in a package with more technology and premium creature comforts." At the heart and soul of the 2013 SRT Viper is the venerable, hand-assembled 8.4-liter all-aluminum, V-10 overhead-valve engine. Improvements for 2013 include a new, ultra-high flow and lightweight composite intake manifold, high-strength forged pistons, sodium-filled exhaust valves, new catalysts to reduce back pressure and an aluminum flywheel that reduces reciprocating losses. More than 25 pounds has been shaved from the fully dressed engine. Preliminary performance ratings for the SRT-engineered V-10 Viper are 640 horsepower and 600 lb.-ft. of torque -- the most torque of any naturally aspirated engine in the world. The Tremec TR6060 six-speed manual transmission has been improved with a shorter throw shifter, closer gear ratios and a final drive ratio that has been shortened to 3.55 from 3.07. The 2013 Viper models will be more engaging to drive and top speed is now achieved through 6th gear with maximum engine speed (redline) at 6,200 rpm. Starting with a stiffer structure that provides 50 percent more torsional rigidity, the chassis of the 2013 SRT Viper benefits from numerous enhancements -- many learned through racing efforts with Viper GTS-R and Competition Coupe models. Major updates include the addition of a new aluminum "X" brace under the hood that ties the suspension pickup points to the magnesium cowl super casting and contributes to improved torsional rigidity and stiffness. A new aluminum impact beam at the front of the car contributes to overall mass savings and improved weight distribution while providing excellent crashworthiness. Structurally, many areas of the chassis were reworked to take advantage of new materials, reduce thickness in some areas and reshape components for more structural rigidity in others. The result is an overall weight savings of approximately 100 pounds. At the rear, the suspension has been re-engineered with the toe link moved forward of the axle for better tow control and dynamic stability. A new, driver selectable two-mode suspension system, featuring Bilstein DampTronic Select shock absorbers with both street and track settings, is standard on GTS models. For 2013, SRT Viper models ride on standard Pirelli P Zero, Z-rated tires with substantially improved overall performance, cold weather performance, enhanced overall grip and steering response on a variety of road surfaces while also broadening the performance envelope. An optional SRT Track Package features Pirelli P Zero Corsa, "soft"-tuned, "racing-type" compound tires that improve handling and precision further on the road or the race track. For the first time, standard safety technologies such as electronic stability control and traction control help to maximize traction performance at virtually any speed and driving environment. All 2013 Viper models will come with a steering-wheel-mounted launch control switch, allowing for optimal acceleration from standing starts. Stopping performance for the 2013 SRT Viper is engineered to provide shorter stopping distances, better modulation, improved durability and balanced brake performance without fading under extreme conditions. Four-piston Brembo brakes with fixed-aluminum calipers, and vented rotors with a diameter of 355 mm by 32 mm, are used at all four corners. Brake calipers are forged and weight optimized by fully machining all surfaces. The calipers are among the stiffest available with distortion from heat nearly eliminated even under the most demanding braking conditions. The available SRT Track Package features lightweight and slotted two-piece rotors from StopTech. The all-new, driver-oriented interior cabins of the SRT Viper models have been totally revamped for 2013 with superior craftsmanship, premium material appointments and performance-oriented technologies. For the first time, all major interior surfaces are sewn and wrapped with additional padding applied in comfort areas. On the Viper GTS model, all surfaces are fully leather skinned, and standard accent colors are applied to the seats, doors, center console and stitching. Quality fit and finish across the lineup is showcased by triple-paint-finished Gun Metal appliquéon the cluster bezel, HVAC outlets, window switch bezels, shifter base, park brake bezel and the integrated passenger grab handle on the center console. Standard high-performance racing seats from Sabelt feature a lightweight Kevlar/fiberglass shell created by a state-of-the-art resin transfer molding technology for mass reduction and long-term durability. Both driver and passenger enjoy improved comfort from thigh support and deep side bolsters designed to match the extreme lateral acceleration capabilities of the SRT Viper. Seating position in the 2013 SRT Viper models is 20 mm lower for more room and enhanced performance-driving ergonomics. Seat travel is extended by 90 mm overall, which enables expanded seating options from a more rearward positioned bulkhead. For the first time, seat height can be adjusted by up to 40 mm -- manually on the SRT model and power controlled on the GTS. The new 2013 Viper is the most spacious model in the history of the nameplate. The floor pan and bulkhead have been extended approximately 90 mm to provide improved legroom and more rearward seat track movement. Designed specifically for the 2013 SRT Viper, the new 7-inch, full-color, customizable instrument cluster display uses a full-time analog tachometer readout in the center to confirm the performance driving feedback philosophy of the Viper. Drivers have a wide range of custom and personal options such as an additional digital speedometer readout just below the tachometer. The vehicle information is clearly communicated with easy-to-understand icons. Intuitively controlled through a simple four-way steering-wheel control, the driver can configure the screens to display the information they desire, easily mixing and matching information. The 2013 SRT Viper lineup includes the new, next generation Uconnect Access in-vehicle connectivity system that provides drivers with access to more information, emergency services, more entertainment and improved graphics. Viper customers can choose between two Uconnect Media Centers, RA3 and RA4, which provide a range of new features and multiple ways to control media in the vehicle. The system includes an 8.4-inch touchscreen along with a set of hard keys for commonly used functions, including traditional knobs for tuning the radio bands and radio volume. Touchscreen buttons along the bottom of the screen allow drivers to easily access the radio, climate controls, navigation, phone, and new, select, certified applications. The new, highly sculpted steering wheel has a host of finger-tip mounted controls for audio, Uconnect, cruise control (first application) and launch control. SiriusXM Travel Link also is available with Uconnect, providing premium data services and information to make every trip more efficient. SiriusXM Traffic works with the vehicle's navigation system to display traffic speed and traffic flow information along with accident information to assist drivers in routing around congested areas. An expanded SiriusXM channel lineup includes exclusive programming, including the new SiriusXM Latino channels, an auto industry first. A range of Harman Kardon surround-sound systems are available across the SRT Viper lineup that feature the latest in audio system technology. All Harman Kardon audio systems include a high-voltage class D amplifier with tracking power supply and up to 11 channels of amplification. The Harman Kardon system with exclusive Logic 7 surround-sound processing is available in the Viper GTS model with a total of 18-speakers, including four subwoofers located behind the seats. All Harman Kardon systems in the 2013 SRT Viper lineup include high-performance, high-efficiency GreenEdge technology loudspeakers that are extremely light and include rare earth magnets. The magnets inside each speaker ensure efficient speaker operation and enhanced performance. The audio systems operate on 32 volts -- so the new and improved sound system achieves more than double the acoustic power of the current system. The all-new, timeless exterior design blends contemporary execution with evolutionary refinement. All-new carbon-fiber hood, roof, decklid and aluminum door panels are firsts for SRT Viper models resulting in significant weight reduction, improved high-speed stability and a slippery .364 drag coefficient. The forward-hinged hood carries the redesigned Viper badge -- aptly named "Stryker" by the Viper Club of America -- positioned in the center; and offers unobtrusive access to several service points and the SRT-engineered V-10 powerplant. The classical low-stance and the extreme cab rearward proportions that have become the unmistakable silhouette of the iconic supercar, return on the 2013 SRT Viper models along with the dramatic fender "gills" -- another traditional Viper design cue that helps to extract heat from the engine compartment. The 2013 Viper models feature a contemporary take on the traditional "double-bubble" roof configuration that maximizes headroom for the driver and passenger while maintaining a low frontal area -- allowing additional room for helmets during recreational competitive driving. Dual-function, bi-xenon projector headlamps are tightly packaged with white light-emitting diode (LED) daytime running lamps and LED turn signals in a sinister "snake eye" configuration. Functional "blisters" incorporated into the 70 mm projector headlamp lenses create a three-dimensional view that gives Viper a distinctive glare. The lower-front grille is purposefully designed as an evolution of the traditional Viper low-profile cooling opening configuration and discretely carries a refined V-shape structure. The exhaust system continues to exit forward of the rear wheels and now carries further refinement with cast aluminum, sill-mounted exhaust bezels. For the first time, the 2013 SRT Viper models carry LED taillamps that integrate stop-and-turn illumination in one element. Snakeskin texture in the lens carries the surface work seen in the gills and hood textures. With dark-masked lenses, the horizontal lamps appear dark until the LED elements fire. Each lamp carries 50 LEDs that provide a unified "crystallized" illumination effect. The five-spoke, forged-aluminum "Rattler" wheel design on the 2013 Viper model is available with fully polished (standard), fully painted Hyper Black or fully painted low-gloss black finishes. The Viper GTS has a split six-spoke forged-aluminum "Venom" wheel design with three available finishes, including polished face with graphite-painted pockets (standard), fully painted Hyper Black or fully painted low-gloss black. Available SRT Track Package wheels are ultra-lightweight, track-ready wheels in Hyper Black or matte black finishes. The Chrysler Group's Street and Racing Technology (SRT) brand uses a successful product development formula featuring five proven hallmarks: awe-inspiring powertrains; outstanding ride, handling and capability; benchmark braking; aggressive and functional exteriors and race-inspired and high-performance interiors to remain true to its performance roots. 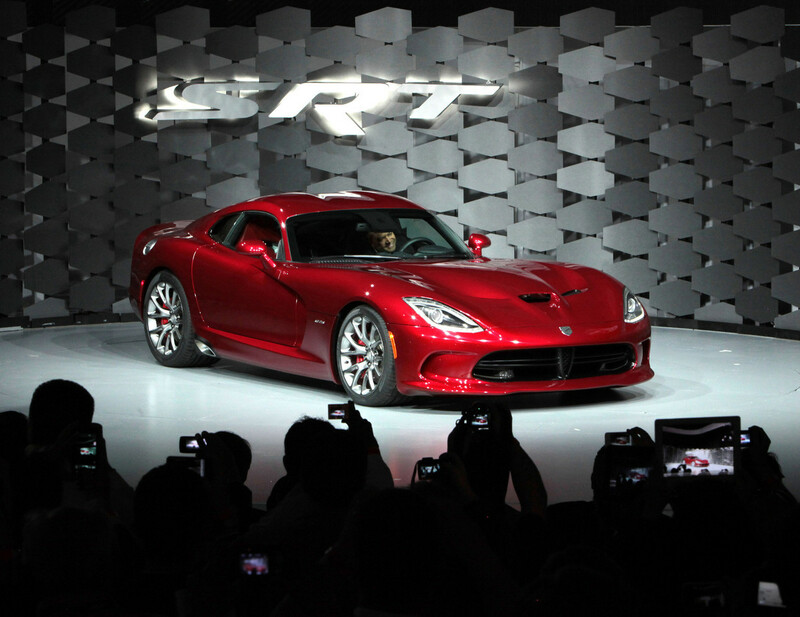 The expansion of the SRT vehicle lineup in the 2012 model year features four new products that are world-class performance contenders and bring the latest in safety technologies and creature comforts. These products include the Chrysler 300 SRT8, Dodge Challenger SRT8 392, Dodge Charger SRT8 and Jeep Grand Cherokee SRT8. Making its highly anticipated return to the high-performance sports car market in late 2012 is the new 2013 SRT Viper and SRT Viper GTS. The SRT flagship performance machines arrive with more power and performance, superior craftsmanship, new technologies and creature comforts.